Volunteer Vine- Coming to your inbox! What another email? No, its better than that, it’s another Volunteer Vine! Around the office, as a team, we have dug into the archival information from the past 20 years of Camp Kudzu. Sometimes, that means a box of photos or a three-ring binder or a file folder with a faded label on it. 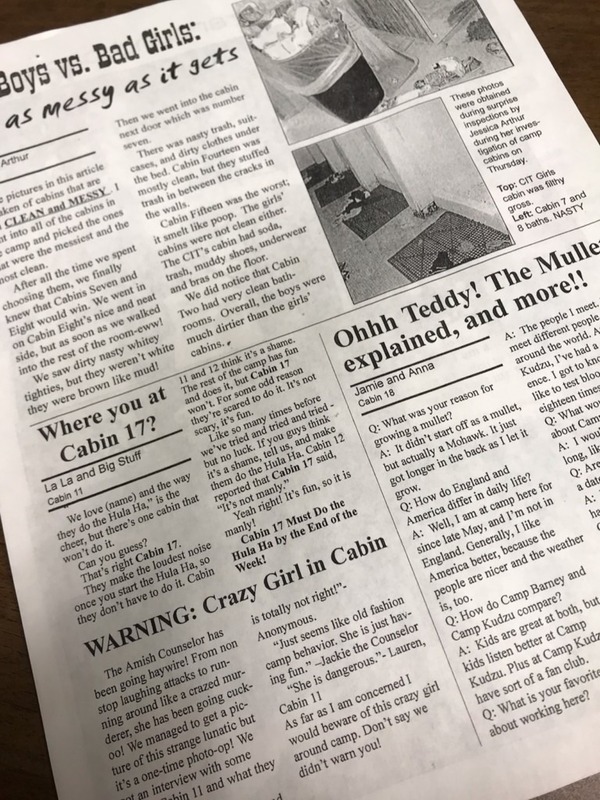 During the discovery, we’ve seen volunteers that had more hair at one time, some interesting choices in short length, and a pile of camp newsletters entitled the Daily Vine. Oh, it’s coming back to you… the Daily Vine. I am amazed at some of the content and how some of the “polls” made it to press and the amount of energy it must have taken to put together a 4-6 page issue DAILY during camp. There are days at camp that, thankfully, I didn’t untie my shoes from the day before because the time saved in just being able to stick my foot in the tied shoe, went a long way in getting the things on my to-do list is done. Hail to the editors! The format allows us to approach concepts that do not necessarily fit within the structure of the website. Articles on youth development, back pocket activities, staff orientation concepts, pre-work for camp, etc. will be featured. Occasionally, a behind the scenes look will be shared… translation- you will know first. We hope this will be a welcome addition to your inbox and encourage you to take the time to read through it. As people who regularly receive large amounts of email, we never just wanted to contribute to the noise. Keep a lookout for it mid-month. Let me know what you think!